Chimene Van Gundy runs and manages 5 different companies. She is known as “The Mobile Home Millionaire” and “Queen of Mobile Homes” because she has fixed, flipped and wholesaled more than 500 units to date in less than 4 years! She now owns a portfolio of $8 million in manufactured home parks across the US with 706 units under management – all whole being the mother of five children! 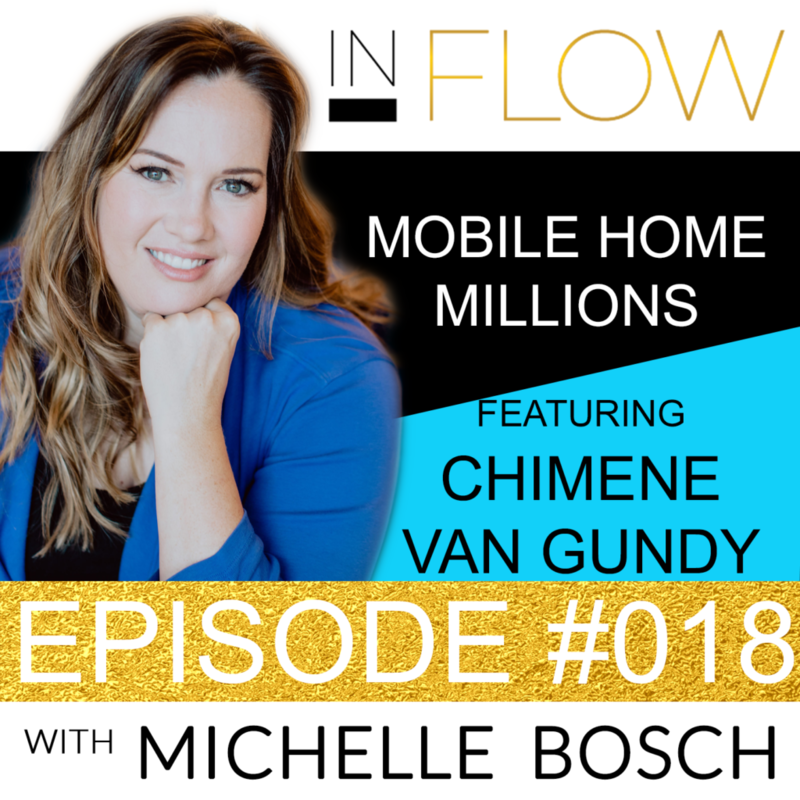 In this episode, Michelle Bosch chats to Chimene about how she overcame adversity: coming from the foster system with no financial education to becoming a multi-millionaire! When life hands you lemons, making lemonade is okay. It’s not the end of the world and you’ll figure it out. And don’t live and breathe by one deal. Have enough deals in the pipeline where if one goes south, you’re not stressing about it. Michelle: Welcome to the “InFlow” Podcast. I am your host, Michelle Bosch. I see a gaping hole across society that focuses on the outer work, and forgets about the inner work, when what we really need is to bridge the gap between prosperity and spirituality to live a life in flow with inflows of light, inflows of cash, inflows of creativity, inflows of grace in our lives. Each week, join me for powerful messages and interviews that will leave you inspired and ready to step into flow in your entire work. So now, let’s go. I have been looking forward to today’s episode. I have the privilege of having an amazing real estate investor with me today. She is a friend. We’ve known each other for some years now. She is the only woman-owned business at our own “Ultimate Boardroom Mastermind”. We’ve recently collaborated on the Amazon best-selling book Wealth for Women with another 17 of the nation’s top women real estate professionals. That book launched back in November, and it was an instant success. And I am just thrilled to have her here today and learn from her. My guest today is, Chimene Van Gundy. She runs and manages five different companies. 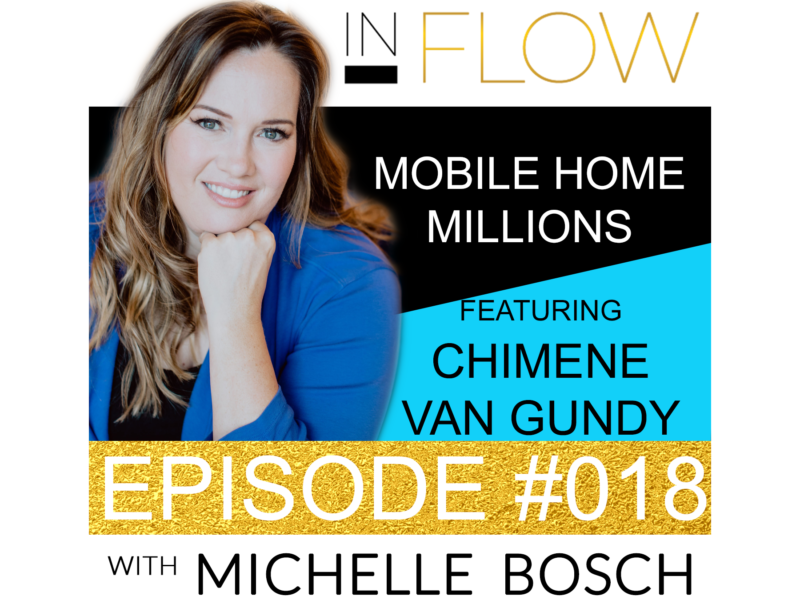 She is known as the mobile home millionaire, and the queen of mobile homes because she has fixed, flipped, and wholesaled more than 500 units to date, all in less than four years, which is incredibly impressive. She now owns a portfolio of about $8 million worth in manufactured home parks, across the U.S., with 706 units on their management. And that is all while being the mother of five children ages 23, 17, 15, 7, and 5. And don’t tell me that this woman that I have here today is not like a superwoman. Chimene after being laid off in 2015 I believe, from her corporate job, decided to not return to a job, you know, and just go at it alone. She read “Rich Dad Poor Dad.” And in this book, I guess she had a revelation. You know, it was really life-changing for her. She knew that there was something that she wanted to go out there and do. She took some real estate education classes and got herself a mentor. And, well, the rest is history. So without further ado, welcome, Chimene, to the “InFlow” Podcast. Chimene: Thank you, Michelle. Thank you so much for having me. Michelle: I am delighted to have you here, Chimene. Thank you so much for making that time with everything that you have going on. So, let me, right off the bat, start by asking you because you have an incredibly fascinating story. How did you grow up around money and finances because I know, to a great extent, this is the reason why you do what you do? So tell us a little bit more about that? Chimene: Sure. So actually, I didn’t. We grew up pretty poor. There was 9 of us in about a 1,400 square foot home, at the time, with one bathroom. And, of course, when you’re young, you don’t really know how poor you are. But I grew up in Des Moines, Iowa. And I’m the fifth of seven children. And so my dad worked 85 to 90 hours a week to put food on the table. And we didn’t have much. And my parents their, basically, I guess, idea of money was, ‘We don’t ever have enough.” You know, it was the struggle and never having enough. And I remember going to bed, several times as a little kid, worrying about whether or not we were gonna have a place to live or food on our table. So that kind of happened. And then through that, I was a victim of abuse. And so I was put into foster care as a teenager and ended up being in 20 different homes in a matter of just a few years. And was re-abused in the foster care system. And so I made my way from Iowa to Georgia, basically, and was in foster care in Georgia. And that’s kind of another story in and of itself. But anyway, my upbringing, my childhood was not the best. I would say that the best thing that I was taught, from my parents, from the time that I lived with them, was a good work ethic. So we were taught to work. We were taught the value of hard work. And that really carried me…has carried me through today. Michelle: Wow that is incredible. You know, you’re really a phenomenal story of rag to riches, you know. So tell me how, in spite of all of this that is going on in your early life, how do you get started in real estate? Like, how did that get sparked in you to go after real estate investing? Chimene: Well, so basically, what happened was I…I was married for about 14 years and then went through a really not-so-good divorce. And then I was single for a while. And then I met my husband now and got remarried. But during this time, my ex-husband struggled with keeping jobs and paying child support. And so when I married my new husband, I really didn’t think that it was his responsibility to take care of the kids that I brought to the marriage. So I brought four kids with me to the marriage. Our five-year-old is ours together. And so he was always willing, but I didn’t ever feel like that was his burden. And so I had started with a corporate company in New Braunfels and build up their division really, really well, and then was laid off unexpectedly. And I remember going…getting into my car and crying on the way home, and figuring out how I was gonna tell my husband who is the love of my life. Like, my husband that I married to now, Chad, is the absolute love of my life. And I had no idea how I was gonna go and tell him that I was laid off. And so at the time, we hadn’t even been married two years yet. And Paisley was only I think not even a year old. And so, as you mentioned, I have a bachelor’s of Art in criminal justice with a minor in law and a minor in sociology. And so I, you know, have done paralegal work for years. And so I, basically, supplemented my income at the time by being a signing agent. And that’s just the notary. That’s a notary who goes out and they close [inaudible 00:07:39]. And so I was doing that on the side, and then was talking to a friend one day. And they said, “You really need to read “Rich Dad Poor Dad.” And I read the book in three days. I was amazed. I had never looked at money that way in my life. And it just literally changed my life. And I know that’s so cliché, but it really did. And so I started getting online and doing some research, and found out that Kim Kiyosaki actually had her own independent women section of “Rich Dad Poor Dad.” And so I googled, and they had a free introductory, one-hour introductory course in San Antonio that you could go to. So I went to that introductory. And they had a drawing for a three-day basic training. And wouldn’t you know it that fate aligned? I’ve never won anything in my life. And I won that three-day basic. Chimene: Four hundred dollars, and they pulled my name out of the hat. And I was like, “Oh, my gosh, like, the stars are aligning.” So over Mother’s Day weekend, as my Mother’s Day gift, I asked Chad to watch all the kids. And he let me go to this three-day event. And that’s where I was introduced to my mentor, Dr. Mary Jo Wilson DR TAX LIEN. And I was just intrigued. So it was three days. I mean, you know, they taught us the Rule of 72 and, you know, your 4 buckets of money, and all these things. And I’m, like, you know, all these just preconceived notions that I had, all these sacred cows that I had about the wealthy and making money were just all basically put to rest that day. And so at the end of it, in order to take, you know, two classes and a mentor, which I knew I needed, it was gonna cost me about $20,000. I had no idea what I was gonna do. I asked them to give me seven days, to hold the price for seven days, and they did. And so I went home, and I sold a bunch of stuff that I owned. Chimene: I sold paintings, some Thomas Kinkade paintings. Michelle: You were determined. You were driven. Like, if you want something, and you know it in your gut that that’s, you know, in the right place, you make it happen. Absolutely. Chimene: Exactly. So I went home, and I sold some paintings, and I sold some jewelry that I had. I sold a whole collection of precious moment figurines that I had been collecting since I was a little girl. And I parted with all of it because it was stuff. And I came up with 17,000, and my husband loaned me the other three. And I went and I bought…I bought my courses. So I bought the basic class, which was Crucial Operations of Real Estate or Core, which is now Momentum with Rich Dad Company. And then I learned wholesaling because I have no money and no credit. So I learned wholesaling. And so I took the classes. Finished up my classes at the end of June. So I got those out of the way. Michelle: And I guess Jack must have been there, my husband, at some point before you left them because that’s where you heard about the land part, and you kind of put that also together along with mobile homes is what I’m thinking? Because you were still taking classes, right? Chimene: Yeah. That was actually in September. So my first symposium was in September in Dallas. And that’s where I met Jack. Chimene: So, Mary Jo came out July 13th, 14th, and 15th of 2015 and taught me what I know now. So remember, I never took a class on mobile homes. Everybody thinks that I did, but I didn’t. And then she came out and taught me what I needed to know. And from July 15th to September 23rd, I made about $200,000. Chimene: Right. And that included spending a weekend in Dallas at a symposium where I was introduced to Jack. And I wholesaled land and made $25,000 in 24 hours. And [inaudible 00:11:43]. Michelle: I know. You are our fastest student to date to make this work. We still tell the story because it’s fantastic. I mean, talk about being an action taker. You are the number one person that comes to mind when I think about action taking for sure. So then you take the classes. You meet Mary Jo. And through Mary Jo, you find your current focus, which is manufactured homes in that asset class. So tell us, why that asset class? Chimene: Yeah. So, it was really interesting because…so wholesaled… You know, my first two wholesales were houses. And then I was going to the tack [SP] sales and introducing myself to other investors including [inaudible 00:12:23]. So they kept asking me when they found my background, “Can you fix title issues on mobile homes in Texas? Their statement of ownership. Can you fix those issues?” I was like, “Sure.” So I started fixing the issues. And so they just kept sending me deals. So next thing I know, this was when I realized that all these investors had this really bad negative connotation about how mobile homes was just trash, trash, trash, trash. So, I just started getting hundreds of leads. And I was, like, “Oh, my God, I got something.” So then my first two mobile homes, I did rentals. That ended up being a big mistake. Lost $8,000 because what happens when you have rentals, you’re dealing with termites, toilets, trash, and tenants. And they weren’t changing the filters in the AC units. And the AC units went out. And in Texas, when it’s 110 degrees and people has got kids, you can’t let that go. You gotta immediately fix them. Michelle: The same here in Phoenix. It needs to be fixed within 24 hours, absolutely. Chimene: Right, exactly. And so I called Mary Jo, and she said, “Chimene, turn them into seller financing.” And I said, okay. And I did. And so from here on out, now all of my deals have been seller financing, which is great because then they’re responsible for the mobile home. It’s sold to them as it. If they don’t change the filters now and their air conditioning unit and it goes out, they’re fixing it. So, that’s kind of how all this stuff started. You know, and I’ve had my bumps in the road. I mean, September 24th, our house caught on fire. So we started, you know, and…so basically got started in June, you know, made all that money. And then September, I had to put the brakes on everything because we moved eight times, in four and a half months, because our house had caught on fire. So we were displaced. And then I had to re-launch my business in 2016, which I did. But at that point, I knew it worked, and I was hungry and determined that I was going to make something happen. And the biggest epiphany for me was April 5th, 2017. And I get a phone call from my CPA. You know, I was negative $50,000 net worth when I started. And I get the phone call that day, and he lets me know that my net worth was 4.5 million. Chimene: I remember crying. Mary Jo was with me, and she said, “Why are you crying?” And I was, like, “They’re happy tears.” Because for the first time in my, Michelle, I was able to feed my children without depending upon my…whether my ex-husband had a job and paid me child support or not. And that day is the day that I said I was liberated. And I literally was liberated. April 5th, 2017 is my day for me because it was the day that I was liberated from ever having to depend on a man again. And that gives you power. Chimene: You can feed your babies on your own, and never have to worry about it anymore. Michelle: Mm-hmm. Wow, that was I bet quite a momentous occasion. I can totally sense it just with the emotion that you are sharing the story with us. Thank you so much for being so vulnerable and opening, inning yourself up to us and letting us into your world as to how this all came about. I greatly appreciate it. And I know that you mentioned right now some of the…one of the first pitfalls that you ran into, when investing in mobile homes, and that was the renting versus the lease optioning. What are some of the other common pitfalls to avoid when investing in manufactured homes? Chimene: Well, sure. So, there are several. You know, this is kind of gonna be funny. But everybody thinks that one of the pitfalls of manufactured housing is it’s not attached to land. So with manufactured housing, if it’s attached to land, it’s real estate or real property. If it sits on a lot, in a mobile home park, it’s personal property. And there’s so many benefits of that. But one of the pitfalls is people think they have to be on land. And the park knows…you know, the manager knows everything going on in the park, and so your asset is protected versus if it’s on land and it’s attached to land and it’s real property. So it’s kind of almost opposite between houses and manufactured housing, right? So one of the pitfalls is if it’s attached to land, and your seller financing because, at any given time, they can take off with the mobile home. And then what do you do? Michelle: Mm-hmm. Mm-hmm. Yeah, wonderful. So then the solution is owning them within a mobile home park? Chimene: Correct. And having them be personal property where it’s like a car. And there’s so many benefits to that because, one, we don’t have to follow [inaudible 00:17:53]. Now, we do have to follow the safe act. And, you know, they have to be closed with a Residential Mortgage Loan Originator, or an RMLO, to make sure that they can afford the payments. And we’re not like charging some insane amount of interest, right? Chimene: You know, you get a higher rate of return on them because it is personal property, and people think that it’s more risky. But I would love to share some stats with the audience because it’s actually not that risky. Chimene: According to the Manufactured Housing Association, in 2017, the stats were there’s 22 million Americans that live in manufactured housing. Of those 22 million, 4.5 million makes six figures a year. So it is literally changing the landscape of our country, really. It is the last frontier for affordable housing. Now, apartment used to be…apartments used to be affordable housing, but because of, you know, what I wanna say, Wall Street and other things that have come in, the requirements for apartments, a lot of people can’t meet. The money, the rent money that they want from apartments, has skyrocketed. So really I tell people manufactured housing or mobile homes is really kind of the last stand in America of affordable housing. And so when you look at the stats and you think of places like Florida, and you’ve got all these seniors living in, you know, manufactured housing in these beautiful communities with clubhouses and pickleball courts. And they’ve got walking trails, and it’s a golf cart community. And they’re happy because when your mobile home or your manufactured housing is personal property, it’s like a car. You pay a couple of hundred dollars a year and that’s it. [inaudible 00:19:39]. And so it’s become affordable. And so those stats really mean something. And so as you know, there’s three asset classes only that are recession proof. And that one is manufactured housing, two is land, and three is self-storage. And so if you’re in any of those industries, you’re good. Michelle: Yeah. Yeah. We have definitely experienced it while everyone was hurting. You know, come recession time back 2008, 2009, we had…I’m not gonna…you know, I’m not say that we didn’t have an adjustment. There was a bit of an adjustment for us as well. But it was maybe a 10% adjustment in our ability to sell for the prices that were used to selling or people defaulting on their seller financing notes. It was minimal compared to everyone absolutely around us losing their shirt doing homes or anything else. So, yeah, I totally get that. Now, there’s a lot of talk from investors, Chimene, that they have predominantly two problems. Either they don’t have enough deal flow, or they have problems with fundraising. On the deal flow side, what do you attribute your success to with manufacturing homes? How are you getting your deals? Chimene: So being very creative. And also what people don’t understand, too, is when you have a mobile home park, especially when you have new management, and they have all of these old manufactured houses mobile homes that they wanna get rid of, what you do is you go to the park and you have a conversation with them. It is actually gonna cost them more money to come in and bring in a new unit and set it up than to have those units rehabbed. And so what I started doing was put together a portfolio. And I would drive around, and I would tell them, “This is our latest rehab. If I can make these homes look like this, and get you somebody in here, and I take…you know, I take care of lot rent, are you guys doing anything with these? Would these be acceptable to you?” And that’s how you can get them for free or for very little money because the parks don’t wanna deal with them. And if it means they don’t have to spend their money to bring a new unit in, then they are more than happy to let you rehab that unit. And usually, typically, as long as the outside of the unit looks fantastic and it matches all the other units, then that’s a game changer. So that’s one thing. That’s where I was really creative. And we talked about this, Michelle, even in boardroom, is that real estate is a relationship business, and net worth is your network. And so that’s why I said, “Women, we have an edge on men in this. We are communicators. We make relationships and connections. And from a spiritual level, that is the essence of being feminine. That’s an essence of who we are as women. We are nurturers.” And so we are so good at making relationships that that’s what I did. I went around and I made relationships with all these different mobile home parks with their managers. I talked to the owners. I made relationships with other real estate agents, in other parts of Texas that had connections with the other managers of these mobile home parks. And anytime there were lots empty, or they had units that they were gonna get rid of, we were able to go in there, and we were able to rehab them. Michelle: What is that typical discount, or what are you getting a mobile home at price cost basis, and how much are you investing, and how much are you selling them for approximately? Chimene: Sure. So I’m getting them anywhere from free to about $3,000, putting about 10 to 15,000. So we put no more than 15,000 in them. So usually, we have 20 all in. And then I’m selling them for 40 to 45, on an owner finance term, for about 7 to 8 years, okay, at about 12% to 15% interest. Michelle: Wonderful. That is beautiful. Absolutely beautiful. How many of these do you do a month? Chimene: About 30 to 40 right now. Michelle: Wow. Now, when you’re doing that kind of volume, now let’s switch a little bit to the fundraising side, is this all self-bootstraps, self-funded, or are you having to do fundraising on that in as well? What are you doing on that end? Chimene: Yeah. So basically, what I’ve done is…this was the other part of my business that I’m very passionate about. You know, I quickly realized by being in “Rich Dad” and talking to these people in these symposiums that there’s some…there’s a lot of people out there that have $20,000, $40,000, $50,000 in a nest egg or and even a small little retirement account that they don’t know what to invest in to grow it. And they can’t do something with the reach because they’re not accredited, investors. So what I’ve been able to do is put together a program where they can invest in. And then that their money goes to one specific unit. And that unit is rehabbed. You know, so we rehab it. We get the inspections on it. We get our electrical, our plumbing all that stuff done. And we put an owner financed buyer into it. And then we actually…so when the person pays the deposit, we keep the deposit. But then the investor yields that and that return for five years. And so it ends up being like a really good return for them, a way for them to grow their money. And they’re not having to come up with a bunch of money to do an investment. So, a lot of times, I do have that. We allow people to invest in a unit or two to get started. And then it just kind of grows from there. And so I’m able to get, like, foreclosures or repos from the different dealers. You know, we get them sometimes from oil fields, you know, some FEMA trailers. I mean, all those things. You’re just creative. Or from the mobile home parks themselves. So, it’s just putting all of this together. And that’s what we’re able to do is I created literally this turnkey system and worked out all the bugs. So this just flows. Michelle: Awesome. So then you started by first finding the homes in existing mobile home parks. And then at some point, you transition to actually owning the mobile home park. Michelle: And it’s, basically, at the point where you bring investors, you know, into the game is when you’re able to, basically, control the actual park at this point, and start creating what we call forever cash, right? Chimene: Absolutely. And so now with the…you know, and the other thing with the whole opportunity zone fund…I’m not sure if your audience is familiar with that. But the job that created this amazing kind of map across the U.S., that’s known as opportunity zones. And so if you put money into as opportunity zone fund, and you keep it in there for 10 years, you’re not taxed on the gain. So right now, I’m working with my attorneys, and we’re actually getting ready to create one of these funds so that people can invest in this fund. They can grow their money for 10 years. And all we’re gonna be doing through that is acquiring parks. And so we are gonna have a CFO that’s gonna manage that, that’s gonna actually, you know, give reports to our investors and take care of all that for us. And then that way we’ll be able to actually bless people. And I think, for me, you know, my lifetime goal is getting 10,000 people a home. And I know that you’ve seen some pictures of my rehabs. I take pride in the manufactured homes that we rehab. I want it to be a place where my grandmother would live. And so that’s what I always think of with every house that we rehab, “Is this the place I’d be okay letting my grandma live?” And that answer is always, “Yes.” And that makes you feel amazing. And then the fact, too, that I get to help people build their retirement, or actually create some cash flow in their life that changes people’s lives. And so it’s helping people. I have a couple right now where they’re taking care of six elderly. They’re both sets of their parents, and then one set of grandparents. And so that cash flow that they receive, it helps them tremendously with stuff that they do. She always sends me stuff and says, “Thank you so much for that investment.” See, they were not able to be accredited, investors. So, they really didn’t have…they couldn’t find anything else where they could get a good return with not a lot of money. And so that’s what we’ve been able to do. I say we get to bless people’s lives. You know what? Chimene: It’s one of the best things about what I do. Michelle: Yeah, absolutely. It’s part of what feeds you and gives you the drive to keep going. Now, in order to acquire over 700 units right now, you must have a superpower. What do you think is your superpower? Chimene: I think my superpower is being able to…it’s really I think being creative and putting the deals together. Chimene: Uh-huh and then the relationships. Those definitely are my two superpowers. I can kind of look at something and see it differently than others, and put it together in a way that creates a win-win situation for all parties where everybody’s happy. And then at the same time, maintain and keep and build long term relationships. That’s what I love. Michelle: And the creativity is very feminine. I mean, even amongst men, anytime you are having an idea, that’s creative work that is the right side of your brain working. So you are definitely in the flow, as I would like to say in terms of creativity, when you’re coming up with structuring deals and so on and so forth. What do you wish you would have known at the beginning that you know now? Chimene: Well, a couple of things. When you first start out, you’re just kind of…you’re testing the waters and you don’t know everything. So I would say that when I first started out, the first thing that I wish I would have known kind of is what I’ve known now. The learning process. The way that I read a contract. The way somebody else would interpret and read a contract. So, when I first started doing this, we didn’t have disclosures. Now we have disclosures. You know, those are just kind of little things that you learn. And then the other thing that I think is that when life hands you lemons, making lemonade is okay. It’s not the end of the world and you’ll figure it out. And don’t live and breathe by one deal. Have enough deals in the pipeline where if one goes south, you’re not stressing about it. Chimene: I think those are my three lessons. Michelle: Overwhelm yourself with deals. Yeah. How do you incorporate faith and spirituality into your life to get in flow? Like, you wake up and oh, my god, you are busy because there’s five kids, five…or you have five businesses. I mean, you’ve got all the stuff that is going on. And so how are you bringing some groundedness and some centeredness into…? I mean, we all live crazy lives. But you, specifically, oh, my goodness. Tell me what are you doing? Chimene: So I’m a very spiritual person. I wouldn’t necessarily say that I’m religious. I do have Christian beliefs. I do believe in God and Jesus Christ, but I’m very spiritual. And I know that there is a soul part of our being that needs to be fed as well. I stay in flow. I do do some meditation and prayers. Most of those happen when I’m in my bubble bath. You know, that’s one of my favorite things to do. And the other thing that I love to do is I am kind of crazy about horses. And so right across the street, from where we live, is a place where I can go anytime and saddle up and get on a horse. And that’s something that I’ve been doing at least twice a week. And it really keeps me grounded, and I just love it. You get on that saddle and that horse and you just feel free. And it’s like it’s a place to clear my head and just talk to God and be thankful. And then the other thing that’s really kept me grounded, too, that’s really, I think for me, changed even stuff with my kids, I started having everybody write three things every morning that they’re grateful for when they wake up. And just by doing that, it has shifted. I can’t even tell you the change that it’s made in my household with my husband, with my children. And, you know, we just experienced a death. My mother-in-law unexpectedly passed away on the 8th. We buried her last week, and that was extremely difficult. And so even through now and all of this, those gratitude journals are really helping. And they’re helping my kids. And so it’s just every day waking up and writing down three things that you’re thankful for. And I just noticed that the more that you focus on what you have, the better outlook you have on everything because we all have something. I mean, if you have a roof over your head, and food in the fridge, and air in your lungs, really, you’re blessed. Michelle: Yeah, absolutely. Absolutely. You know, and gratitude for what we have brings more of what we have, but also openings and opportunities into new possibilities. You know, so I am a firm believer of gratitude. We do it at the end of the day to, basically, close out the day and, before lights are, out finish the day in that spirit. But at the beginning of the day, whatever works, you know, for people because that also sets the intention for the day. So I can see how it has transformed your family’s life doing it at the beginning of the day as well. Now, if people wanted to know a little bit more about you…I know that you are now also not just investing in mobile homes and manufactured homes and parks, but you’re also helping others that wanna come and join you invest in mobile homes also learn how to do this. So what would be the best way for people to reach you, find out more about what you do, or what are you doing on that end? Just go. Feel to share. Chimene: Sure. So on April 11th will be my very first webinar. Michelle: Kind of like a master class I guess, yeah? Chimene: Yes. And you can go to mobilehomemillions.com. So mobilehomemillion.com. And I’m gonna be teaching people how to make money wholesaling mobile homes through apps on their phone. And I am so excited about this, Michelle, because…you know, even in boardroom, we’ve talked about really connecting to really what I wanna do. And this is something that I just…I’m so excited about it, I can hardly sit still. I cannot wait to help single moms, college students who are struggling, or new family members starting out earn, you know, $3,000 to $5,000 wholesaling mobile homes. It’s so very simple. And the fact that it’s so simple, I think it’s gonna blow people’s mind. But I just keep thinking, as a single mom, if you can make one woman, one woman $3,000, even if she does one deal a month, how that will change the trajectory of her life. And, you know, we’ve said this before. You know, you make a man a millionaire, you make him a millionaire for life. You make a woman a millionaire and you change five generations. Five generations. Michelle: Yeah. Because women tend to…one of our core values is generosity and recirculating our wealth. So bringing others along with us. Absolutely. Chimene: Absolutely. You know, just saying that gave me goosebumps. And so the impact that I’m gonna be able to have on this, by teaching people how to do it, I’m truly excited and blessed in. I don’t know that I haven’t been a part of Ultimate Boardroom with you and Jack where I’ve grown so much from this experience. You guys have given me so much confidence in my abilities. I don’t know that I could have done this without your guy’s influence. I just want you to know that. Michelle: Thank you so much, Chimene. Chimene: [inaudible 00:36:00] teaching people how to be able to use mobile homes and manufactured housing as a way to really free themselves. And my tribe name is gonna be “Cash Creators.” So everybody that comes into the mobile home millions platform is going to be known as a “Cash Creator.” So I love that, right? Michelle: Yeah, “Cash Creators,” ka-ching, ka-ching. It sounds like money, and it smells like money to me. Chimene: You know, I really wanna create a movement. And I tell people, you know, the more people I teach how to do this, the more homes we get to give to people. The more [inaudible 00:36:34] veterans get to have homes. The more people off the street. The more seniors. The more people that we can have affordable housing that would never ever be able to own a home in their life. We get to give that to them. And what better gift that can you give, in this life, than giving somebody a home, and a roof over their head, and a shelter, and a place to live. And then the ability to transform their life. I mean, it’s just…my cup is so full and it runneth over right now, and it really just speaks to everything. Chimene: …through adoption. Uh-huh and that we can put this in the hands of the over 600,000 foster kids in America that are in this country. They need to hear from us because it doesn’t matter where you came from. All that matters is where you’re going and how you live your life, and what are you gonna contribute to this world. So our goal and mission is to put a book in every one of those children’s hands from people like them, who’ve been in their shoes that have walked that same journey and road. And I just can’t wait for that transformation that’s gonna happen to all those wonderful children who are in the system, at no fault of their own, who’ve been handed a bad deal. And hopefully, this book will transform their lives and let them know that their bad deal they were handed, their bad card, can be changed and turned to make it a card where they get to help everybody else and change the world. Chimene: And I’m really excited about that as well. Michelle: And you should be. That is amazing because it’s teaching a fundamental lesson that it doesn’t matter where you start, but what matters is where you’re going, you know, where you’re ending. And I, right now as I am listening to you, I’m like, “Oh, my gosh.” Even reflecting on my own journey of helping women, you know, have a voice. And bringing them, and being able to interviewing them and being inspired. And I’m like, “Yes.” I’m so excited that I got, you know, you to be here today with me. And we are in so in alignment, and I’m just feeling blessed that I had the opportunity to have you here with me today. Thank you so much, Chimene. I hope that if you are listening to today’s episode that Chimene has left you inspired and ready to get into flow, and have inflows of cash, inflows of faith, inflows of grace in your life. Thank you very much, and until the next one. I hope this episode left you feeling inspired and ready to get inflows of cash, inflows of light, and inflows of faith in your life. I welcome your reviews on iTunes. Please leave me a review and help me create an amazing community of women in flow. Thank you as always for sharing your voice by going to michellebosch.com and joining the conversation about this show. And while you’re there, grab a copy of my 10 commandments to living a life inflow. You can also follow me on Facebook @michellebosch and on Instagram @michelleboschofficial. Thank you very much, and until the next one.